On Sunday 23 April 2017, the Governor of Assam and the Acting Governor of Meghalaya Shri Banwarilal Purohit visited the Swaminarayan Akshardham in New Delhi, a grand mandir showcasing and celebrating Indian art, culture, traditions, and values, through its breathtaking stone carvings and exhibitions. On behalf of His Holiness Mahant Swami Maharaj – Spiritual Head of Swaminarayan Akshardham and BAPS Swaminarayan Sanstha – senior sadhus traditionally welcomed the Governor with a garland of flowers, tilaka (vermillion powder) and the tying of the sacred kalva (sacred thread) at the Mayur Dwar (Peacock Gate). 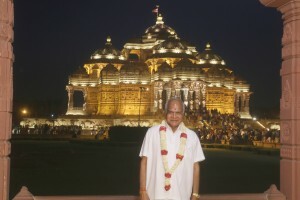 Governor Purohit first visited the Swaminarayan Akshardham Mandir, where he witnessed the world’s ‘Largest Comprehensive Hindu Temple’. After paying respects to Bhagwan Swaminarayan, he admired the Mandir’s art and architecture. He learned how His Holiness Pramukh Swami Maharaj, the former spiritual leader of BAPS, inspired thousands of volunteers and artisans to create the mandir to share the message of love, peace, tolerance, non-violence, co-existence and global harmony. Governor Purohit marveled at the Gajendra Pithika (Elephant Plinth) that includes 148 life-sized carved stone elephants depicting message of social harmony, peace and spirituality. He offered prayers for world peace and harmony by offering ‘abhishek’, the ceremonial pouring of sanctified water from 151 holy rivers, lakes and ponds across India, on the sacred image of Shri Neelkanth Varni (the teenage form of Bhagwan Swaminarayan). Thereafter, Governor Purohit experienced the educational exhibitions: Sahajanand Darshan (Hall of Values) – robotic shows depicting the ideals of nonviolence, honest, harmony and faith, Neelkanth Darshan – a Giant Screen film on the epic journey of Neelkanth Varni throughout India and Sanskruti Vihar – a cultural voyage that sails through 10,000 years of India’s glorious heritage, highlighting India’s contributions to humanity through the ages. Finally, they witnessed the Sahaj Anand Water Show, a theatrical presentation about an ancient Upanishad story with modern fountains, projections, lasers and fire. Completing the visit, the Governor of Assam and the Acting Governor of Meghalaya Shri Banwarilal Purohit wrote in the visitor’s book, “Today’s visit to the Swaminarayan (Akshardham) Temple will be remembered by me as a memorable day of my life. In one word, if I had to describe the Swaminarayan temple, it is totality unimaginable. We were thrilled to see Bhartiya Sanskruti (Indian culture) in totality. This institution is providing Dharma and Sanskruti in our country. There cannot be any comparison with any institution – not only in India but in the world. Total dedication and selfless sacrifice of swamijis and volunteer is the foundation of this institution. My many many thanks to Mahant Swamiji Maharaj and Pramukh Swamiji Maharaj for giving me this wonderful opportunity on this auspicious day of Ekadashi. My regards to all the swamijis of the institution.